You can't always have a tailwind, sometimes it's going to be a headwind. I wonder if anyone can help me find a replacement for this seatbelt latch. It is from a 1992 GMC 1/2-ton Sierra V6 pickup (3.8 liter, manual trans, AC). It's blue, but that is not too important. When I put the metal hook into the latch it doesn't catch. I can't figure out how to take it apart to see what is wrong. This is the driver's seatbelt latch but it comes as a pair (center seat belt latch also). I'd like to ask for some help finding one in a junkyard or from any wreck—I've been told 1988-1992 are the same but I don't know for sure. Not available in this area. I'm taking a road trip on April 15 and need it so the three of us can buckle up. Also, If anyone has ever worked as a front end alignment tech please contact me. Have ya tried ebay? Just a thought. Are ya willing to pay shipping? I'm sure one of us can get one from a junkyard for you if you can't find one. I'm willing to look if needed. Do you use the middle seat a lot? Could ya just flip it over until ya find a new one? Looks the same as the one on my 91 Chevy s-10 rusting in my back 40. I'll check it out today. I've been meaning to tear it apart to turn it into a trailer or something. Might as well start with the seatbelt. Oh, and it's blue too. 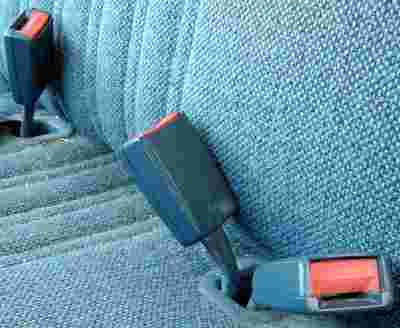 FWIW: There was a federal recall on those type seat belts installed into GM and overseas cars because they would not latch or would unlatch in a crash. The reason it was not found out earlier is "because dead men tell no tales". If you do a web search you can find out more. I buy the non-retractable clam shell (not push button) universal design. It holds up well and is easy to clean inside the buckle. You just have to make sure you click it well to lock it. I was wrong. Mine have a push button on the top of the buckle. I tried to take them out anyways and couldn't get the torx bolt out. They are blue though. I took a pic of them and the part that slides in them. Maybe they're interchangeable. Let me know if you don't find anything. I can pull the truck up to the shop and use a impact wrench maybe. Go to your local chevy dealer. I think they have to fix it free. I had one missing on my pathfinder. Pulled in and they looked for it. Couldn't find it (like I said) They ordered one and installed free. Try them first or your local junk yard. I did a Google search and could find nothing regarding 92 GMC pickup in recalls or TSBs. I went to junkyards in Ogden and Salt Lake. I was told it's the second most requested item for that year pickup. I went to my GMC dealer and escalated it up to national. I got a jerk on the phone that said 36,000 miles and your warranty is over. (I said Nissan warranties safety equipment for the life of the car. He said how long do you think it should be under warranty. I said Isn't GM as good as Nissan--for the life of the car. He said that's not reasonable, we warranty it for 36,000 miles. I said GM will get one more cent out of me when hell freezes over. So I am looking for one from an out-of-commission GMC or Chevy pickup. I am willing to pay a reasonable price plus shipping for this. Doug, the parts are still available for your truck. There are a few different seating options, so if you want to order one, bring your VIN number to the parts department to assure a proper fit. I checked for a 9L8 seating option (split bench) and 24I interior color (blue) and found the latch set available for a price of $125 list, $105 trade price to an automotive facility. I hesitate to provide the part number, as I would want to match it to a VIN number. There is only 1 safety recall campaign on your truck, if it has bucket seats only. There is no campaign on the seat belts. Rebocardo may be thinking of the recall campaign on a similar looking seat belt latch in the Camaro/Firebird/Corvette about the same time. I will be turning over 500,000 on my 93 Suburban this summer. Any chance anyone in Marketing for Chev/GM may be interested in hearing about it? Who knows, they may want to use it in a durability commercial I think I could use a new truck! I now have a replacement seat belt latch, thanks to the forum and specifically to Furby. He went out of his way to help me and came up with an identical pair of latches. That's what it's all about--members helping other members. I have a set of seat belts... can you send me a GMC3500 4x4 Dually to go with 'em? ? Doug, I take it the latches work ok? Ya know Kirk, if it were a 2003 and not a 1993 they would probably buy it back to tear it down since that is a current design They have less interest in old designs and replaced products . One of the biggest fights is to get current product engineers interested in resolving problems that typically happen well after the warranty period. Hey Doug, glad Furby could hook you up!! General Motors Co. is recalling about 425,000 full-size passenger and cargo vans because of reports that the seat belt buckles will not latch or unlatch. The recall, announced Tuesday, affects the Chevrolet Express and GMC Savana from the 2003-2006 model years. GM, the world's No. 1 automaker, discovered the problem through an analysis of warranty claims. Consumers reported problems latching the buckle or unlocking it once it was in place. GM spokesman Alan Adler said there have been no reports of injuries. Dealers will inspect the buckles and replace the upper buckle cover. If the restraint isn't working properly, dealers will replace the entire buckle assembly. The Express and Savana passenger vans have seating for eight people. The cargo version seats two people. Wasn't it a failed seatbelt that led to the unfortunate death of Dale Earnhardt? Improper installation resulting in a cut belt. He was told by Bill Simpson not to do it the way he did. No, he didn't have his harness tight. The other drivers said that he was notorious for undoing his harness in a race. When he hit the wall, it didnt' take much movement to brealk his neck. It was the weight of his head more than the movement of his body that caused his death. He was also against the head strap that the officials were trying to introduce. Since his death, it has become pretty standard. Yes, when your body stays in place and your head is still moving at 180 mph after the car stops, your neck does not stand much of a chance. Even with the strap your brain gets bruised. Page created in 1.142 seconds with 39 queries.